As banks continue to spurn small businesses, the government readies a second round of initiatives aimed at freeing up credit. NEW YORK (CNNMoney.com) -- As small business lending continues to dry up, the federal government is readying two new initiatives aimed at reversing the trend. To unveil them, President Obama traveled Wednesday to Maryland, where he visited a family-owned company that used a government-backed loan to fund a recent expansion. "There are still too many entrepreneurs who can't get the loan they need to open their doors and start hiring," Obama said from the headquarters of Metropolitan Archives, a Landover, Md., company that stores and delivers paper files. "There are still too many who are struggling to make payroll and stay open. And there are still too many successful small businesses that want to expand further and hire more but just don't have the capital to do it." The new measures -- a collaboration between the Treasury Department and the Small Business Administration -- aim to make capital cheaper for community banks and raise the funding limit for loans backed by the SBA. Under the new plan, banks with less than $1 billion in assets will be able to borrow money from the government at a 3% dividend rate. That's a reduction from the 5% rate the Treasury currently offers borrowers through its Capital Purchase Program, a TARP (Troubled Asset Relief Program) initiative. To qualify, banks will need to submit a small business lending plan illustrating how they'll use the borrowed money to expand their small business lending. 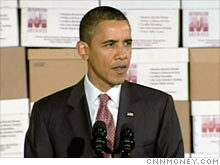 President Obama also threw his support behind Congressional efforts to increase the ceiling on SBA loans. Currently, the maximum loan under the SBA's major lending programs is $2 million. The proposed legislation -- which would need the approval of Congress -- would lift that limit to $5 million. The new initiative would also increase the maximum size for SBA-backed microloans to $50,000, up from a current cap of $35,000. "Of all the steps we're taking to move this economy from recession to recovery, I continue to believe that the success of our small businesses will be a foundation upon which our future prosperity is built," Obama said in his address. "So we will continue to do whatever we can to help these businesses grow and thrive. And I am confident that the steps we announced today will do just that for small business owners across the country." The obstacles: This is the Obama administration's second attempt to jump-start small business lending. As part of February's stimulus package, Congress allocated $730 million to the SBA to temporarily waive fees and increase the guarantees the agency offers banks that make qualifying small business loans. Despite those measures, SBA lending continued to fall, dropping 36% in the 2009 fiscal year compared to a year earlier. In March, Obama and Treasury Secretary Tim Geithner appeared at the White House before an audience of small business owners to formally kick off the stimulus efforts. Geithner used the event to announce a new Treasury edict: The biggest recipients of TARP funds would need to begin filing monthly reports on their small business lending. The move was intended to shame or inspire the big banks into upping their lending, but it didn't work. In the last five months, the 22 biggest recipients of government TARP funds have cut their lending by $8 billion, according to the monthly reports they've filed. As of Aug. 31, the 22 reporting banks held a collective small business loan balance of $261.3 billion, down 3% from when they began reporting in April. Now Treasury is trying to address the problem by going at it from the other end: Make cheap capital available to small banks, in hopes they'll use it to increase their local lending. "While we have made progress stabilizing the financial system, we need to do more to help small businesses get the credit they need to grow and hire," Treasury Secretary Tim Geithner said in a written statement released Wednesday. "The President's announcement today has a simple goal: help small businesses by helping the community banks whose business it is to serve them." The White House released statistics backing up its approach. Among banks with assets of less than $1 billion, 56% of their business loans go to small companies, according to the government data. From larger banks, only 21% of business loans go to small firms. The catch is that small banks have a smaller role on the lending scene than their larger rivals. Of the 15 banks that put the money into SBA-backed loans last year, only four are so-called community banks: Live Oak Bank in Wilmington, N.C.; Excel National Bank in Beverly Hills; BNB Bank in New York City; and First Financial in El Dorado, Ark. The other 11 banks all have assets of more than $1 billion. Some community banks say they don't even need additional capital. Frank Sorrentino III, Chairman and CEO of North Jersey Community Bank in Englewood Cliffs, N.J., said that while he commends the administration for attempting to extend help to small businesses, additional TARP funding is not going to affect his lending. "The TARP program has provided support for banks that probably should have failed," Sorrentino said. "I believe that banks will make loans to qualified borrowers, and so I don't believe you need to do a whole lot on the community banking side to get banks to lend." Sorrentino's bank, for example, has increased its balance sheet by 40% in 2009 and does not need additional capital, he said. Still, he's pleased to see the Obama administration take up the cause of strengthening small companies. "I understand what they are trying to do and I absolutely commend the administration for recognizing that it starts with small businesses," he said. To significantly jolt the pace of small businesses lending, financial giants -- like Bank of America (BAC, Fortune 500) and JPMorgan Chase (JPM, Fortune 500) -- would have to commit to increasing their lending, too. So far, that hasn't happened. Bank of America's small business lending has dipped 4.1% in the last five months. The Charlotte, N.C.-based megabank says the decrease stems from the recession's grim effect on small businesses' balance sheets. As a result, Bank of America has tightened its lending standards, according to spokesman Don Vecchiarello. Increasing the max loan size: The second major component of the President's proposal involves lifting the maximum on SBA loans. "These are the type of loans that Joe and Doug used to expand this business and create new jobs," Obama said, referring to his hosts for the day, Metropolitan Archives co-owners Joe Incarnato and Doug Peters. "Larger loans will help more small business owners and franchisees grow." However, the majority of small businesses looking for loans are not pushing up against the SBA's loan ceiling. Of the 44,000 loans the SBA backed last year, fewer than 15,000 were for more than $150,000, according to SBA data. That has some small business owners scratching their heads over the new initiatives. Chuck Blakeman, president of Denver-based small business advisory firm Team Nimbus West, blasted Wednesday's announcements as "another photo op for politicians that does absolutely nothing to solve the crisis for small business owners." To score an SBA loan, businesses still have to convince a bank to issue it. With SBA lending down sharply, that's a daunting challenge. "Somebody please tell me how raising the limits on loans people can't get is helping them," Blakeman said. Obama left the door open to further intervention, if these new efforts don't spark a turnaround. "[There's] no question that we have a long way to go," he said.